One of our favorite and most often visited wineries in Paso Robles is San Marcos Creek Vineyard. The winery is located on the southbound side of Highway 101 a few miles north of downtown Paso Robles and well worth the drive. We drove past the beautiful property for years before we started on our wine tasting adventures and always admired the beautiful tudor style “mansion”. Our friends visited the tasting room and absolutely raved about it so it wasn’t soon afterwards that we made a special trip out there. One thing I’ve learned from visiting wineries with this particular friend is that our taste for wine is completely opposite of one another so when she recommends a winery the verdict is still out until I try it myself but surprisingly we both agreed on this outstanding winery. 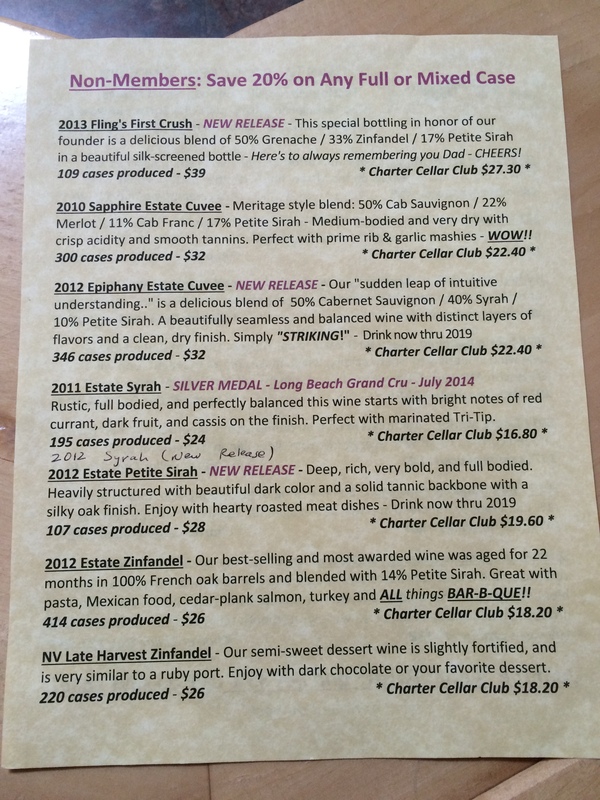 Every wine on their tasting list is superb and though I am a huge fan of Paso Robles wines there are less than a handful of them that I can say that about! The owners Brady and Cathy are almost always in the tasting room to greet you warmly with a smile and share their fabulous wines with you. And did I mention that every wine on their tasting list is outstanding? I’ve lost count of how many times we have been out to this winery and how many people we have recommended to check it out. We’ve been out there for picnics when family is in town, we’ve told visiting friends and family to head out there and they end up becoming wine club members. Our last big family get-together was spent at the winery for a picnic before Ray’s father passed away. Our friends became club members long before we did and we would pay a fee to attend their pickup parties as non-members. We finally figured that since we were loved their wines and their parties it became an irresistible choice to join the club ourselves. As you drive north on the 101 past Paso Robles you will pass Wellsona Rd, just a few miles past that you will see a turnout on the left side to cross the highway into San Marcos Creek Vineyard. You will pass by a large pond on the right and may even see a peacock or two and a few ducks. When you approach the front door of the tasting room you are likely to be greeted by Chloe the sweet Australian Shepherd. I love how bright and open the tasting room is and it has some very nice wine gifts and accessories. We mentioned that this is one of our favorite picnic spots. They have a nice shaded patio with a few tables and a nice view of the pond and vineyards and you are likely to see a peacock up close. Although we love all of their wines, some wines of note from today’s tasting are the 2012 Merlot, 2013 Flings First Crush, and the 2012 Estate Petit Syrah was memorable. All these wines have the classic Bordeaux structure with the fruit forward complexity that this region offers. The White Merlot finally sold out but we hear their will be a new release soon, highly recommend it!